This busy bag is designed for an older pre-schooler and could even be used for kindergartners/first graders depending on their skill level and interests. I'm a huge fan of this busy bag because the materials you will need to make this are incredibly inexpensive to purchase. I spent $1.06 (including tax) for materials I needed that I didn't have on hand. First, you will want to cut the paint chips so that you have the big long strip that your child will clip the clothespins onto. You can use a ruler for this; I could not find mine so I just figured out how much extra I would need for the clothespins, then cut accordingly. I also cut mine in such a way that the paint strip had square edges (as opposed to the round the paint chips came with) and that no wording was left on mine. After the paint chips are cut, take what you cut off the paint chip and put this in a separate pile. I highly recommend putting the paint strips that are part of the busy bag in a bag and putting it away. At least in my world, there could be a tot about and since this busy bag is for when my kiddos are older, I'd like to keep them from being destroyed for now! To cut the paint chips so that the clothespin bit is covered nicely, I used the clothespin itself to measure out each paint chip bit. I just laid the clothespin down on the paint chip in the appropriate color box and traced around the tip of the clothespin. Once I cut out each piece, I put it on the clothespin to see if I needed to cut any excess off; often I had to cut a bit from the long side and short side. To attach the small bit of paint chip to the clothespin, I started off using glue. I do not recommend this. 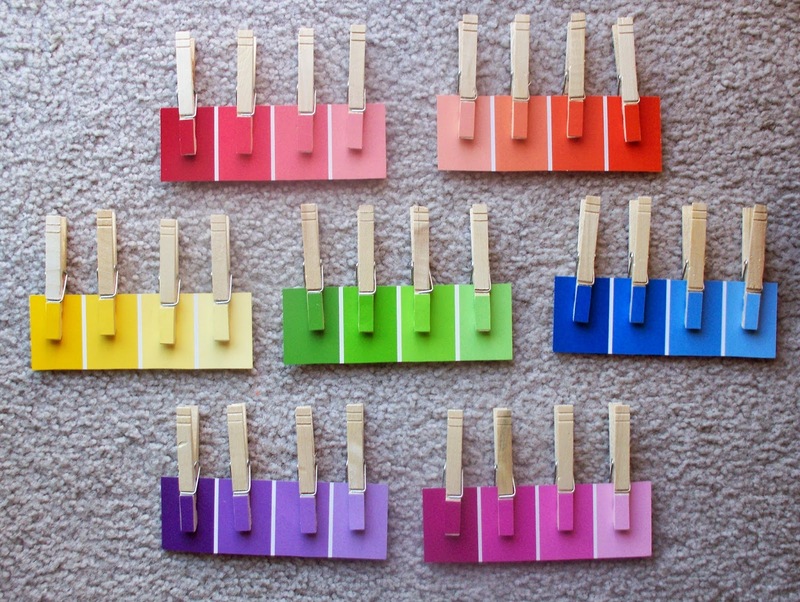 I did use glue on the green clothespins, but I felt discouraged because using glue was taking a lot of time and the short sides of the paint chip didn't seem to be well attached to the clothespin. I switched to using a glue stick, and oh my stars - it was so much quicker, less messy and the paint chip stuck beautifully to the wood. Once all the paint chips are attached to the clothespins, you're done! It does seem this busy bag would take a ton of time to create, but to be honest, it took much less time than I had anticipated. I easily made it in one week (a week in which I worked on other projects, worked 45 hours and took care of my tot while Jason was out of the house for two evenings). I worked on this while Bug was asleep for the night, and I just put on a show on the computer to watch while I worked. I had a good time working on this one, and I anticipate I will make this for other littles in the future for gifts!